Giambattista della Porta (1535?-1615) was the polymath founder of the Academia Secretorum Naturae, the forerunner of the Accademia dei Lincei. 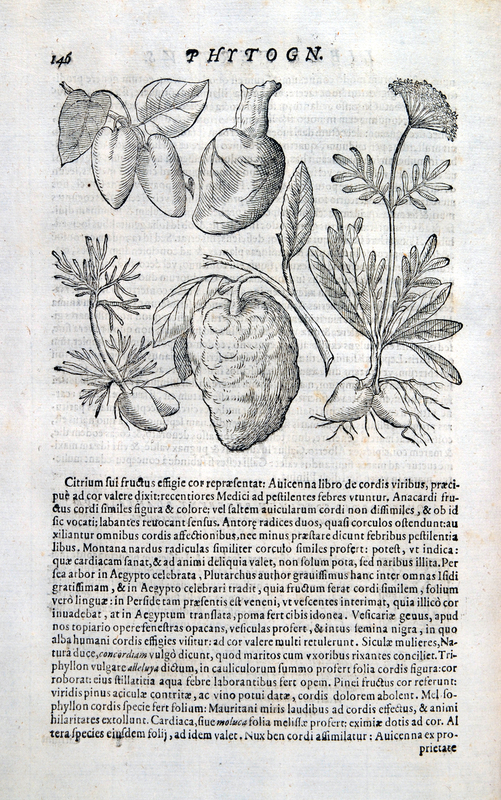 Phytognomonica perpetuates the “doctrine of signatures,” the idea that the shape of a plant can tell us about its medical uses. In this image, we can see fruits and roots in the shape of hearts, along with an image of the organ itself. Perhaps a bouquet of Valeriana–make sure to include the ostensibly cordiform roots–would be a suitable gift for someone suffering from heartache this Valentine’s Day?